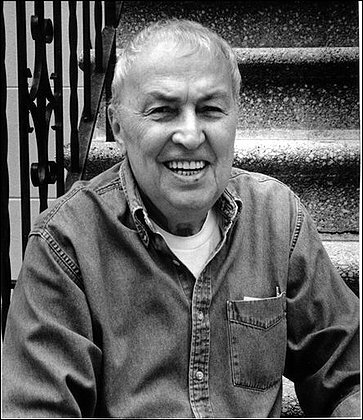 I never met him, but he was the first to publish any of my poems, and Grand Street, which he founded in 1981 and ran until 1990, was one of the great literary journals of recent times. Looking back at my earlier posts on the Bourgeois Gentilhomme production, they seem to be all about the technique of staging, without saying anything about interpretation, about how these technical matters might alter the way we perceive the play. In comparison to works like Le Misanthrope or Tartuffe, the Bourgeois can seem a little one-dimensional and mean-spirited. The would-be gentleman’s pretensions are held up to ridicule at every juncture; he is easily duped, and in the end, thoroughly deluded. There are some good jokes, and classic scenes, like the one with the maître de philosophie, that blend fantasy and satire, but it can all leave one feeling a little weary. The whole turquerie business, reduced to stage directions and nonsense lyrics, just seems like a senseless piling-on. That’s why the music and dance are so essential, and yet including them, even performing them to perfection, is not enough; it has to be done in the right spirit, and that spirit has to match the one that the play as a whole conveys. From the DVD booklet and the documentary portion of the DVD, as well as from the performance itself, it’s clear that the creators of this production conceived that spirit to be one not just of mockery, but of generosity and empathy. We’re made to enter into M. Jourdain’s fantasies. Everything, music, dance, gesture, costumes, lighting, even the stylized pronunciation, serves to embody them, make them sensuous and irresistible. As played by Olivier Martin Salvan, Jourdain is not grotesque; he’s youthful, eager, clumsy, naive, and given to fits of impatience. The fact that he’s drawn not just to material splendor but to “the finer things” (les belles choses) is what cements the union of the arts in the play and lifts it into another dimension. It becomes not just farce but a sort of grand allegory. The production commentary doesn’t shy from drawing the parallel between Jourdain as patron of the arts and the play’s own patron and principal audience: the king himself. Whether or not Louis XIV could look into this parodic mirror with equanimity (and how could a Sun King do less? ), the opposite happens here as well: things outwardly ridiculous take on a kind of wonder and poetry. The booklet points out the best example of this: the maître de philosophie (played brilliantly by Lazar himself) teaching M. Jourdain the vowels. Empty concepts are something Molière can never resist parodying, but here the philosopher’s demonstration is so funny and so lovely that we can only echo M. Jourdain: vive la science! The generous spirit encompasses the other characters as well. Dorante’s unscrupulous manipulation of Jourdain, borrowing money from him and pretending to further his courtship of Dorimène while actually courting her himself, makes him the most dubious character in the play, but here we mostly just admire his smoothness and finesse as he deftly sidesteps each new complication that his own game lands him in. We can hardly grudge him getting the girl rather than Jourdain, who after all has a wife already. Finesse, grace in every sense, is what the play celebrates. Those who have it can be forgiven a lot. And those who don’t, like M. Jourdain, are not to be condemned for aspiring to it. The Globe Theatre’s production of the play in 2004 used this “original pronunciation” in three performances only; the following year the Globe mounted an entire production of Troilus and Cressida in OP. These were the first such attempts since the early fifties. They seem to have been fairly well received, but I see no signs that OP is about to become common practice in the performance of Shakespeare. It does have a nice sound, at least in Crystal’s rendition, and is quite comprehensible after a little adjustment. Easier for an American to understand than a good many modern-day British regional accents. As Crystal notes, it has hints of many modern accents in it, from Irish to West Country to American to New Zealand, without sounding like any one in particular. That’s appealing: it reaffirms our sense that Shakespeare’s language is the common heritage of English speakers everywhere. That would be one clear advantage it would have over RP as a standard for Shakespeare. On the other hand, the difficulty in “placing” the accent creates other problems. What do you do with country or lower-class speech in the plays? RP versus West Country or Cockney may not be the best solution (especially for non-British productions), but OP seems to offer no solution at all: the accents are either going to sound all the same or the differences will have no meaning that we can identify. One possibility would be to subtly shade some of the sounds towards RP or some other recognizably “prestigious” accent for the noble characters, leaving the lower class characters to speak a purer OP. There would of course be no historical warrant for this at all, but at least it would make some sense to modern ears, since many of the sounds in OP are distinctly non-posh. Making puns like Falstaff’s “reason-raisin” clearer is also an advantage to using OP. Restoring perfect rhyme where it has become approximate in modern pronunciation is too, though perhaps not as much as Crystal believes (and much less relevant to the plays than to the sonnets). We can’t really know if Shakespeare always rhymed perfectly. Crystal assumes that he did, and rhyme is indeed a large part of the basis for the reconstruction. It is conventionally held that the first deliberate use of approximate rhyme in English verse was by Henry Vaughan, but who knows? Even if that’s so, half-rhyme has been accepted in English rhymed verse at least since Yeats. To say categorically that rhymes like love-remove “don’t work” in modern pronunciation is a bit extreme. Crystal’s claim that Shakespeare in OP is much quicker than in modern pronunciation is interesting. It seems to rest on the frequent contractions and elisions in Elizabethan speech (many more than are reflected in the texts, apparently), as well as many vowel sounds being shorter than in modern English (such as the common “me” for “my”). Still it seems a bit subjective. Rapidity or slowness of speech is surely not a purely phonetic matter; it involves prosody and rhythm, which may be harder to reconstruct. We also couldn’t object to a reconstruction that makes Shakespeare’s verse scan better, but this advantage carries the same caveats as the case for perfect rhyme. Indeed, even if you think Shakepeare’s rhymes were all perfect, you might well doubt that he always preferred his verse to be metrically regular. In all, the case for OP in Shakespeare seems a good one, but hardly open-and-shut. Using it seems to have been merely one of a hodge-podge of ideas that went into the Globe’s Troilus and Cressida production (which was in modern dress). To make OP really convincing, some fresh overall philosophy of performance that fits with it would be needed. The Bourgeois Gentilhomme production had that in abundance..
A wonderful, unusual writer, whom I knew slightly. NY Times obituary here. Here he is reading at the 92nd St. Y. in 2007. The overture is played by a large ensemble of instruments; at center stage, a pupil of the Music Master is seen, composing at a table an air that the Bourgeois has commissioned for a serenade. The portable desk, the flirting, and so on, are embellishments, apparently, but they seem to flow as seamlessly from the score as the theorbist’s realization of the unfigured bass. *addendum: This was almost certainly the 1973 recording with Gustav Leonhardt directing La Petite Bande, an ensemble formed for the express purpose of recording this music. Listening to it again (or excerpts from the CD, which I assume was just a re-issue of the LP), I have to say it holds up pretty well. But this opening number, not at all. It’s so obviously not a real staging, but a half-hearted “concert” impression of one, that it has no impact either dramatically or musically. No wonder I forgot it was even there. 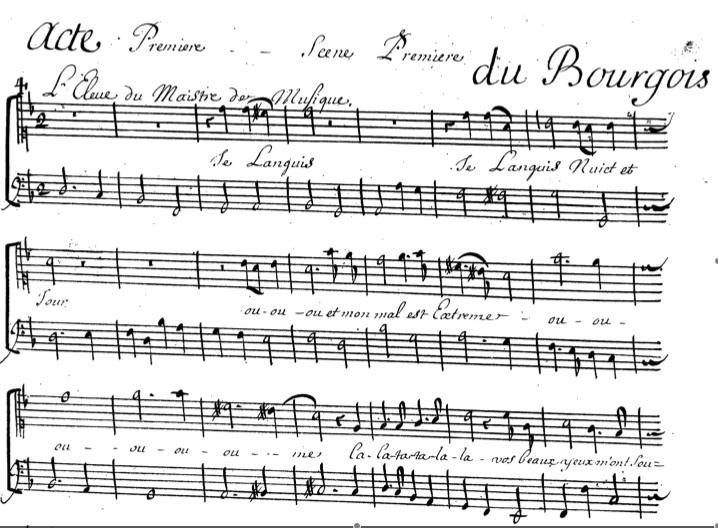 Still, Leonhardt and La Petite Bande must be given credit for beginning the modern revival of this score. You are currently viewing the archives for June, 2010 at Spoken and Sung.